Although known as St Mary's Island I think it's fairly clear from this photograph that the insular role is really only part-time. At low tide the causeway dries out and pedestrian access is possible. The light itself was deactivated in 1984 at which point its ownership passed to North Tyneside Council who have spent significant sums on restoring the lighthouse station as a tourist attraction. The site is open to the public and guided tours of the lighthouse and the lighthouse station can be arranged. 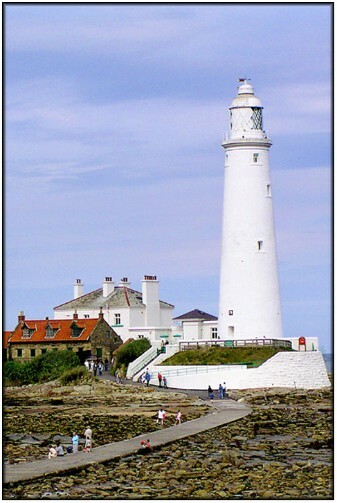 The Friends of St Mary's Island have done much work down the years to ensure the preservation of the lighthouse station as well as the unique environment and character of the island. Their site gives a lot of information about the history of the lighthouse and about access and admission charges and so on - click here to visit their site. Even at high tide, photography is no problem as there is a public car park close to the landward end of the causeway, although the light will generally favour afternoon visits.